People who are best known as actors often have many strings to their bows. David Garrick was a talented writer and today Antony Sher has become a distinguished artist and writer of fiction. Shakespeare himself began his life in the theatre as an actor and would not have been such a successful writer for the stage without this experience. As a mere actor, “an upstart crow, beautified with our feathers” he was criticised by Robert Greene for daring to become a writer who “supposes he is as well able to bombast out a blank verse as the best of you”. Greene went on to describe him as “an absolute Iohannes fac totum”or, as we would say, a Jack of all Trades. Few actors become prolific writers, but it’s become common for them to create their own one-man shows in which they are able to create something for themselves that shows off their own particular talents. One that has been successfully performed round the country is Mark Carey’s play Into the Breach. 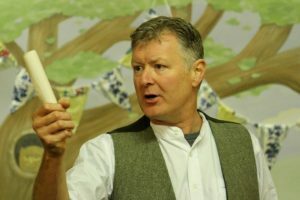 Mark plays all seventeen characters in this portrait of life in a sleepy Devon village during the Second World War. Focusing on Shakespeare’s Henry V the play includes a performance of the St Crispin’s Day speech – well, what actor wouldn’t want to deliver this most stirring of speeches? The play is nevertheless full of nostalgic humour. The show…revolves around handyman George Crocker, who left some of his soul on the battlefields of the First World War. He never speaks about the horrors of the trenches, living a quiet life in the sleepy Devon hamlet of Lowford. The character of George was inspired by Carey’s grandfather Reg Luxton, who was evacuated from Dunkirk and fought through Europe. “He fought through the war – notably at Monte Casino in Italy – and survived. But he was a changed man. In the play, George auditions for the Lowford Drama Club, believing they are doing a pantomime. He meets luvvie Simon Trottley Barnes (“it was never like this at the Old Vic”) with a grandiose ambition to put on Shakespeare for the masses. Next Tuesday, 12 December, at 7.45, Mark will be performing his play for the Shakespeare Club of Stratford-upon-Avon. It promises to be a real Christmas treat: visitors are welcome for £3 and information about membership is to be found on the Club’s website. 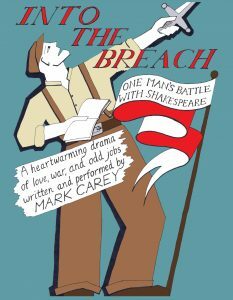 This entry was posted in Legacy and tagged Henry V, Into the Breach, Mark Carey, one-man show, Robert Greene, Shakespeare Club of Stratford-upon-Avon. Bookmark the permalink.